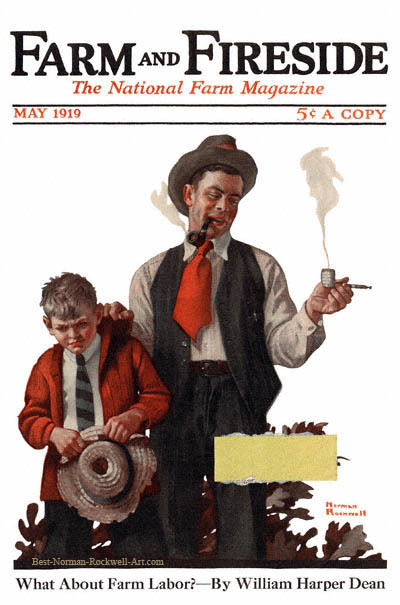 Boy Caught Smoking Pipe, this Norman Rockwell painting, appeared on the cover of Farm And Fireside published May 1919. This was the third cover by Rockwell to appear on Farm And Fireside. Only five Rockwell covers were published by this magazine. Rockwell only submitted to this smaller magazine, and others like it, after the bigger publishers had declined the cover illustration. It is plain to any observer of his career that Rockwell's preference and first choice of publication was The Saturday Evening Post. He believed that the Post cover was America's biggest showcase window for artists. Another ordeal of childhood. And parenthood. This boy had snuck outside to have a smoke. He had to sneak because his father probably would not approve of his smoking at such a tender age. But it would seem that sneaking outside just didn't work! Was he smoking rabbit tobacco? Rabbit tobacco was a common tobacco substitute for young boys, particularly in rural areas. Or did he "borrow" some of his father's real tobacco? Whatever he was smoking, his father caught him in the act. He has grabbed his son by the collar. What is next, punishment, a lecture or just a stern warning? Father is looking away from the boy. He is contemplating the corncob pipe. His is a fine wood burl pipe, no doubt filled with fine tobacco. Is he remembering his first smoke? Remember that this painting depicts an era before tobacco use was vilified in America. The ill effects of tobacco were not as widely known at this time. Today, we would ask how the father can expect his son to resist tobacco given the father's example. Norman Rockwell had a way of capturing the essence of the moment. When he painted this in 1919, it would not have stirred controversy. In the 21st century, no doubt, some would accuse him of detracting from the anti-smoking effort. That would be undeserved. Rockwell was just painting part of growing up.